Awesome 5 star seller. Thanks. Great communication! Arrived earlier than expected! Thanks!! Overall I do like these. They are easy tow ear and sound great. You can do noise canceling without music as well. The downside has been the controls are hard to use when its around your neck. Perhaps a better location for them on the next models, but its not impossible to use. Great product. Is this better than QC20?? Previously I was always using QC20. And I’m always satisfied QC20 noise cancelling level especially while taking flight for trips. Only complain is wire and bulky noise cancelling unit next to 3.5mm audio jack. Now I got new iPhone X and time to consider Bluetooth headphone due to no more audio jack. I don’t like over ear headphone because I’m wearing sunglasses and bulky body. So this QC30 is perfect. So far here are my review compared with QC20. Comfortably: fitting is the same(of course), but no wire is so much better. No hustle is necessary to store phone in my pocket. Really great. Noise cancelling: Based on side by side comparison, QC20’s cancelling level is better than QC30. But just slightly. I feel QC30 is more less stress for ear. Because when QC20’s cancelling is turned on, I can hear very very tiny high frequency noise that generated by cancelling process (because higher noise cancelling level?). I think not everyone can hear this, my ear is very sensitive. But it will not bothering you because your ear will be aligned with this after few times wearing. But QC30 does not generate this. Overall, really great product. 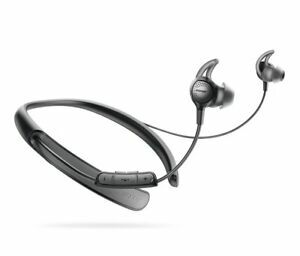 Better than QC20 because wireless! This is huge profit. I’m so happy for this product. One more note. There is no input jack option, so if you are frequent traveler, you cannot use this headphone due to no input jack option. But I always use Bluetooth transmitter(you can buy this at Best Buy, Walmart etc, and it’s about $20) to connect plane’s headphone jack then I can enjoy in-flight entertainment with my QC30. These are the best earphones I’ve ever tried. Noise cancelling is amazing. Sound quality is outstanding. Battery life is great. Factory refurb gave me peace of mind that known issues were taken care of. Great product! Love controlling the amount of noise cancelling. Great product! Love being able to control the level of noise cancelling. Battery lasts all day of continuous use.